So I'm a big fan of silent disco. I have a lot of friends who hate, hate, hate it but I think it's pretty damn cool. A dance party with no speakers. Everyone gets a set of wireless headphones all synced up to whatever the DJ is playing. Take of your headphones on the dance floor and all you hear are the noises of scuffling feet as well as the hoots and hollers of those in agreement with the selection. 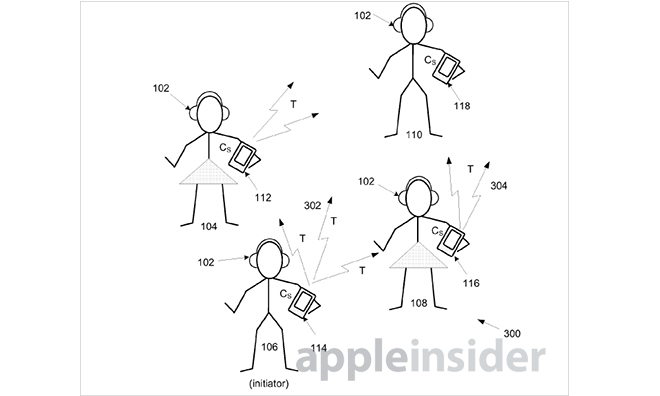 With Apple's patent, geographic location is not a limiting factor, as the invention can use ad hoc wireless networks, Bluetooth, cellular networks, the Internet, or any other means of wireless communication to connect listeners in near real time. To complete a shared group experience, the digital information of a song being played by one user, dubbed the "roving DJ," is passed to connected devices over said networks. In some embodiments, information other than music-related data can be transferred over the network. For example, users can create avatars and accompanying personalized information to broadcast to the group. A session timer can also be sent out, while other data may include overall beats per minute of a song being played.